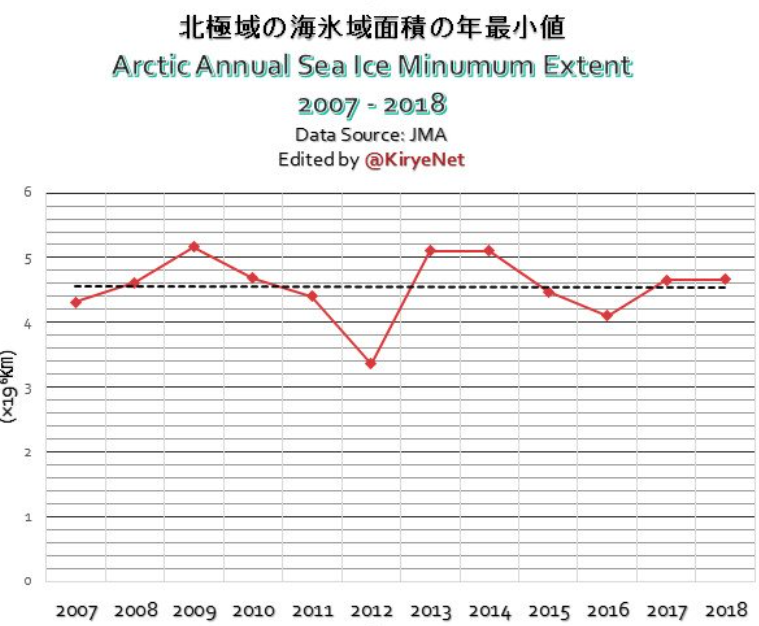 A look at the real observed data on polar sea ice shows that the situation has been surprisingly stable for more than one decade, now, despite the cult-like doomsday prophecies that much more ice would be gone by now. For the climate change cultists who have been banking on climate system collapse and a rescue by global socialists, these are indeed depressing times. What really has been frustrating the climate alarmists is the Arctic, which many “experts” promised 10 years ago that the late summer Arctic ice would be gone by now. 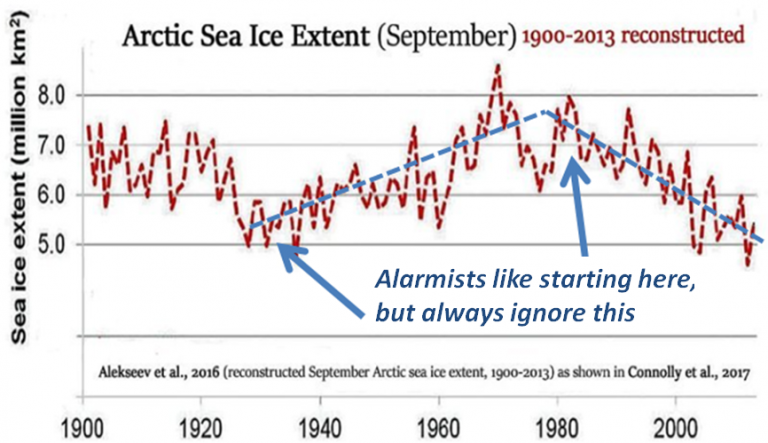 What follows is a chart of the data from the Danish Meteorological Institute (DMI) that shows that nothing of the sort is happening. As we can see, Arctic sea ice volume maximum, which occurs in early spring, still reaches the levels seen 10 years ago. Moreover the all-important summer minimum — considered a “tipping point” by doomsday climate alarmists — is even higher than it was 10 years ago. 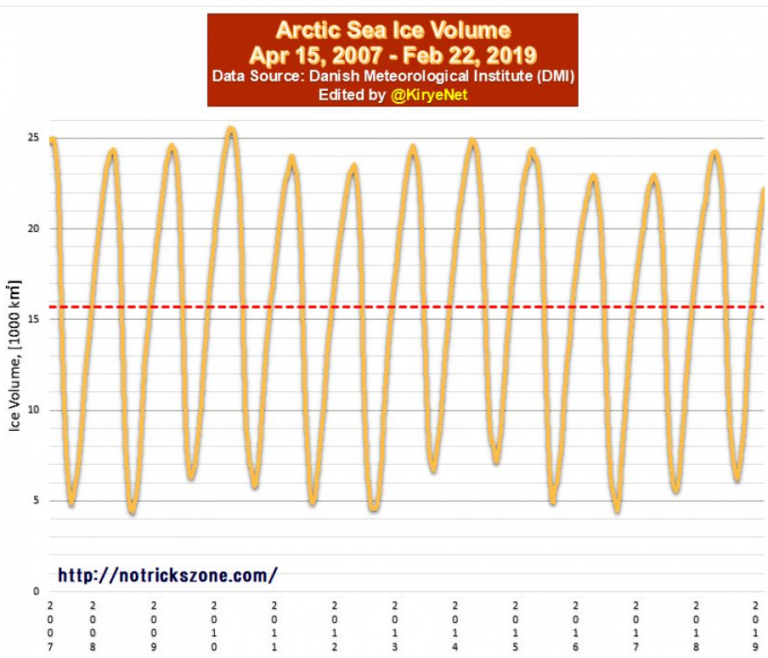 The linear trend for sea ice volume has stood steady for 12 years. So it’s little wonder climate alarmists keep pushing back the goal posts, which they’ve been doing now for 30 years. If there is one thing that mankind should have learned by now while on the slippery slope of civilization is that all the prophesies of doomsday have been wrong and that latest one – climate breakdown – will be no different. There is no evidence showing that this latest end-of world climate prophecy is the one that is going to turn out to be true. In fact, this one is pathetically easy to see through and realize it’s Smollet-quality science. Chart by Alekseev et al, 2016. Comments and rough linear trendlines added by NTZ. The aforementioned chart shows there is nothing unusual about today’s sea ice extent. It’s all happened before. Chart by Kirye. Data source: JMA. If models were unable to get even the first 12 years correct, what performance should one expect even further out into the future? Four years ago, global warming cultists avoided discussion over Antarctic sea ice like the plague. This was because also Antarctic sea ice had totally contradicted the model forecasts and embarrassed the climate scientists. The trend had shown robust sea ice growth since 1979. 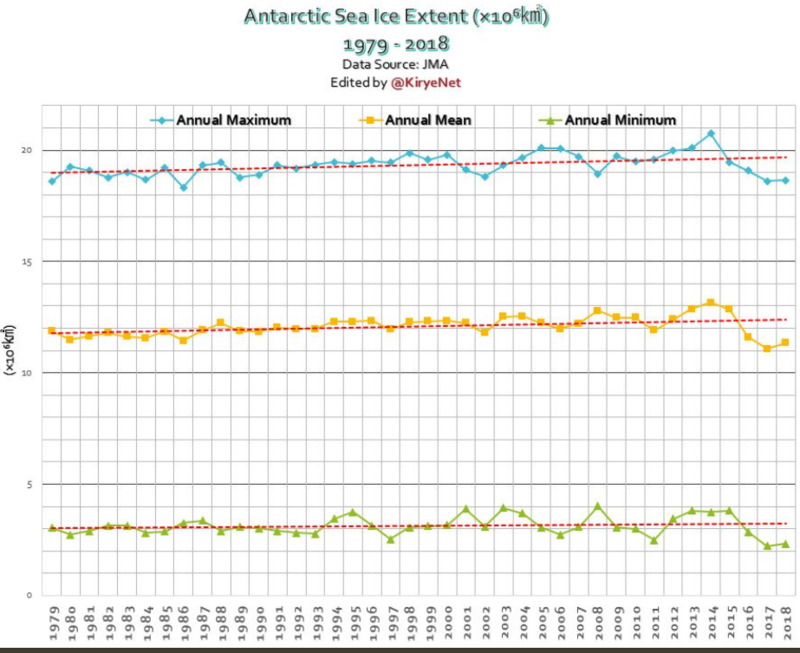 Antarctica sea ice extent continues its long term trend of steady growth. Chart: Kirye. Data source: JMA here and here. However, three or four years of data mean very little on climate scales. The overall Antarctic trend remains one of growth. And even if the trend turned downward over the coming decades, it only would prove a warming Antarctic sea and say nothing about the real cause. What is becoming ever clearer is that many powerful natural factors are indeed at play and that man’s impact is far less than the global warming doomsday cultists like to insist it is. Volume 8. pp.149-153, Royal Society, London. It was the John Daly website that opened my eyes, nearly 20 years ago now, to the fact that global warming wasn’t necessarily a fact. Invaluable website. I think that alarmists will not be reading articles like this. No way! Thanks for the graphs Pierre and Kirye. I used them to make a point on another blog. You both do great work and though I don’t comment here that often I check your site frequently to see what new stuff you’ve posted and value your work greatly. When I post this and similar charts, showing NO MORE DECLINE, they respond by using charts that starts from 1979, which is the standard response to no more decline after 2007. They refuse to acknowledge the evidence using the very same sources as they do but starting in 2007 instead, this is why they are angry when they are confronted with evidence they can’t address, thus the pathetic dishonest deflections. but in there mind they will all drown. Please, any reliable website in Spanish?